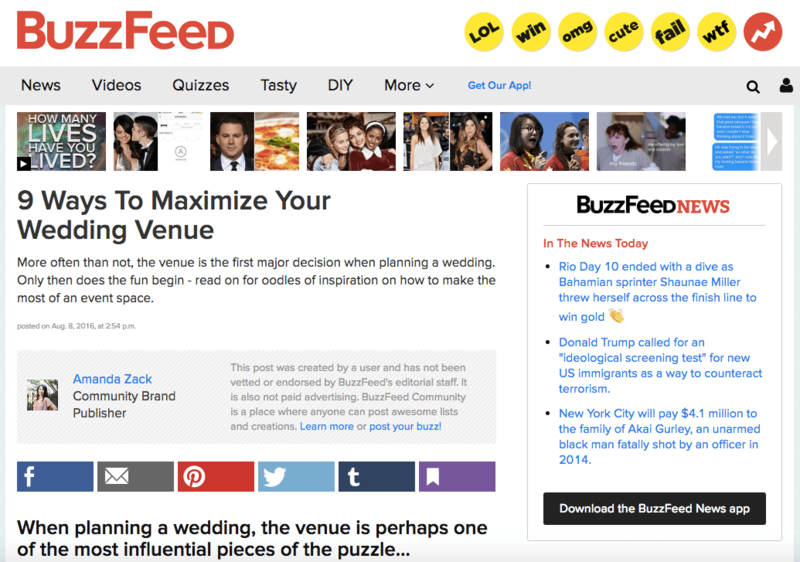 Wedding PR: Buzzfeed, Brides.com, United With Love, and more! Another week, another great roundup of client features, including Buzzfeed, United With Love, Brides.com and more! To see the latest, check it out below. Cocoon Events Group, Historic Mankin Mansion, Be Photography, Don Mears Photography, and Wente Vineyards were featured on Buzzfeed in the article 9 Ways to Maximize Your Wedding Venue. See the full article here. Mike B Photography was featured on United With Love with a Maryland wedding. See the full feature here. OFD Consulting and Fantasy Sound Event Services was featured in Wedding Business Magazine. See the full feature here. Taylor’d Events was featured on Honeybook in a guest article Setting Realistic Goals: The Key To Making it Happen. See the full feature here. Mike B Photography was featured on Charm City Wed with a vineyard wedding. See the full feature here. Taylor’d Events was featured on WeddingWire EDU with a guest blog The Key To Staying Motivated as a Wedding Professional. See the full article here. Destination Weddings was featured on A Bicycle Built For Two with a Cancun wedding. See the full feature here. Cocoon Events Group was featured on Special Events with the guest article What’s ‘In’ for Event Entertainment. See the full feature here. Taylor’d Events was featured on AllSeated with the guest blog Navigating The New Hire Process. See the full feature here. Destination Weddings was featured on Brides.com in the article How to Handle Bridesmaids with Clashing Personalities. See the full feature here.